Drowsiness, fatigue, insomnia, depression, anxiety, and poor quality of life are all potential symptoms of sleepwalking, according to a new study. The research team thinks that sleepwalking is nothing to joke about: in fact, it can be a very serious problem. 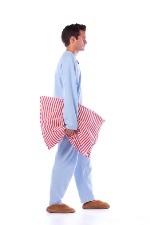 They revealed that about 23% of sleepwalkers do it every night, and 44% do it every week. Here’s the problem: dangerous things happen in nearly 60% of cases, including injuries to the sleepwalker or bed partner in 17% of cases (requiring medical care). This is how bad it can get: one sleepwalker suffered serious head injuries and broken bones after leaping from a third-floor window. Sleepwalking is a form of “parasomnia.” The brain is half awake and half asleep, capable of complex actions, but with no awareness whatsoever. That’s why you might end up hurting yourself, like by falling down the stairs or walking outside on a freezing cold night. This is believed to be the largest study even done on adult sleepwalkers. The researchers used interviews, questionnaires, and assessments to see the consequences of, and health conditions related to, sleepwalking. It comprised 100 patients who ranged in age from 18 to 58. They were compared with a control group of 100 healthy people. Some things, they discovered, tended to trigger episodes more often: stressful events, strong positive emotions (like elation), not getting enough sleep, drinking alcohol, and exercising late at night were all linked to unstable sleeps. What we need to understand here is if you or anyone you know sleepwalks, there may be consequences like fatigue and mood disturbances. Your quality of life may be suffering, and it may be due to what happens when your brain is in this state between sleep and wakefulness. If you think you’re at risk of hurting yourself or others around you, visit a sleep clinic. Try to limit your sleepwalking by getting at the root of your sleeping problems, such as by reducing the amount of stressful events in your day. Lopez, R., et al., “Functional Impairment in Adult Sleepwalkers: A Case-Control Study,” SLEEP. 2013; 36(3): 345-351.